This weekend was my niece’s birthday, so my creative sister decided on a pizza party at the park. It was quite an interesting concept…she provided packets of ready-made dough, pizza sauce, and cheese. She told guests to bring their favorite toppings. Everyone rolled out their dough, made their own amazing concoction, put it on foil, and let it cook on a grill. It sounded a little crazy, but it was adorable! And quite yummy! 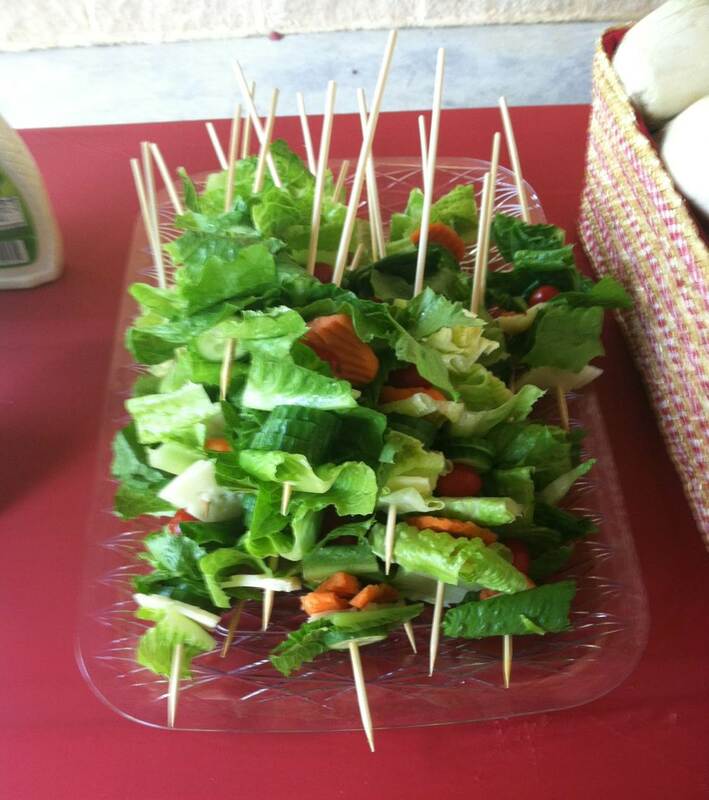 My contribution to the party, besides my sparkling personality,was to bring a salad. 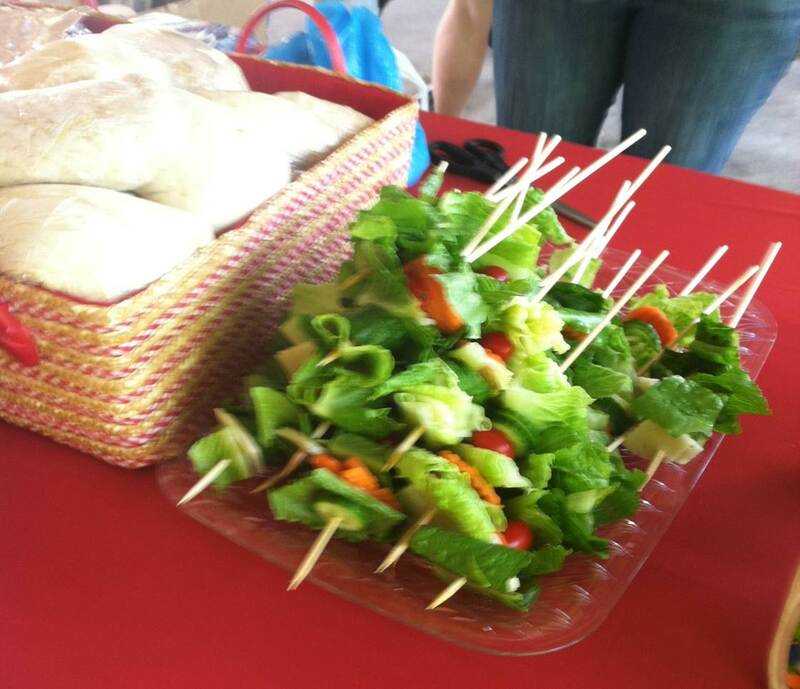 My mother made the suggestion of something she’d seen…salad on a stick. WHAT??? lol. She said, since we’ll be at a park, it may be more “picnic-friendly” if it’s something that people can just grab, dip, and go. OK, I’m always down for a creative twist on a traditional favorite. I gave it a shot. Below are the items that I used, but there are so many salads that you can make…there are ideas all over pinterest or you can just make whatever works for you. Whether you make a Caesar salad, Greek salad, or your favorite house salad, there is absolutely no wrong way to do this. 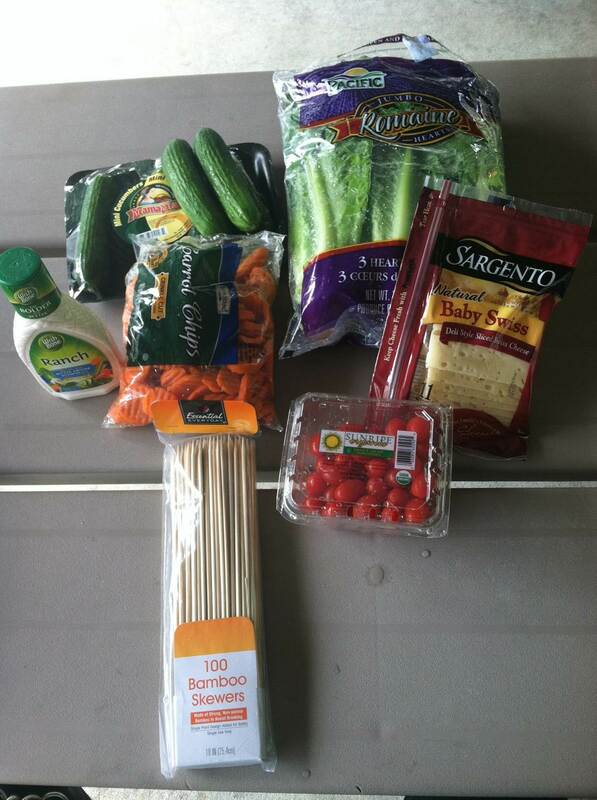 I cut up the lettuce, cheese, and cucumbers, and got started assembling. In the beginning I tried to be cute and logical and symmetrical about it. But I soon realized that was kinda silly, and just started adding items in random order. I will admit, this part is definitely more time-consuming than preparing a regular salad. Not like…hours of work, but definitely more than just chopping veggies, scooping into a bowl and moving on. But the finished product was cute, and the guests liked being able to just grab a stick as they moved down the assembly line. And if nothing else, it was a conversation piece. The next time you try a creative take on a traditional favorite, let me know how it goes!